Australia is said to be one of the trailblazers in PTSD diagnosis and treatment (The Australian Centre for Posttraumatic Mental Health is one especially good resource to check out). 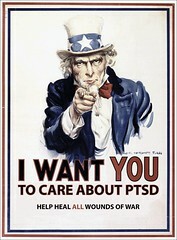 Learn a bit more about what their PTSD research is turning up. 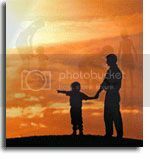 Sons and daughters of Vietnam veterans are three times more likely to commit suicide than those of similar age in the general population (Australian Institute of Health and Welfare 2000, Suicide in Vietnam veterans' children: Supplementary report no.1). They are also more likely to die of accidental death, experience depression and abuse alcohol or other drugs. Since these alarming figures were discovered by accident during a 1998 Department of Veterans Affairs study into the health of Vietnam veterans (AIHW 1998, Morbidity of Vietnam Veterans, Vol 1), momentum has been building for a wider investigation into the mental and physical health of their children. A government-funded feasibility study recommending this should be done is about to land on the desk of new Veterans Affairs Minister Bruce Billson ...stressful familial environments could be behind the children's mental health problems, already highlighted by existing research. While many people with mental illness have a genetic predisposition to their condition, veterans were screened for mental illness before they went into the service, making stress a more likely factor in the children's ill health. "In studies done by clinical psychologists running PTSD clinics for Vietnam veterans, children have reported a high level of dysfunction in families," he says. "When we focused on Agent Orange so much in the past we missed the bigger picture. We are seeing the same sorts of problems in veterans of the Iraq and Gulf Wars, and fighters in World War II are now saying they suffered from the same problems. It is not due to any specific war, it is the generic effect of combat." "If we are going to get involved in military activities as a country either in a peacekeeping role or whatever, we have got to realise that the impact of sending young people to war is not just going to be on the person who goes to war," [professor Hedley] Peach [who is advising the Government on the feasibility study] says. Making sure that we provide support and care for all members of a PTSD family is crucial if we're to ensure a better future for everyone involved.